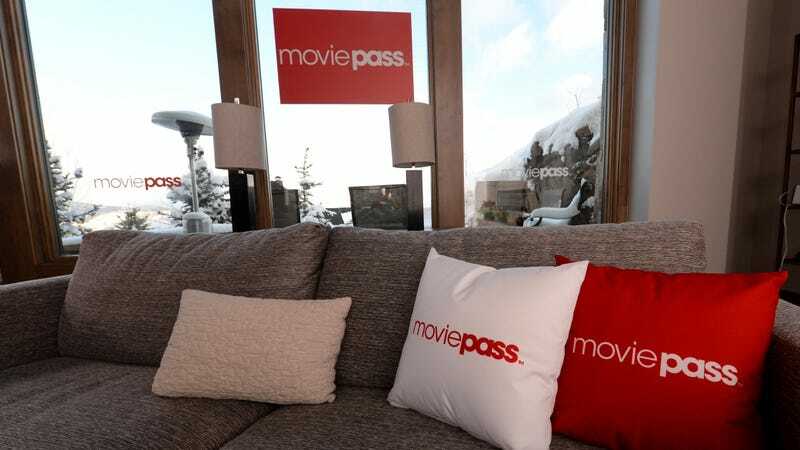 On Friday, it seemed like the end was in sight for MoviePass after the company was forced to temporarily shut down the system that allows subscribers to actually purchase tickets after MoviePass’ parent company missed a payment to one of its fulfillment processors. In other words, MoviePass couldn’t afford to operate at all, which gutted the company’s stock price. Then, once the app was functional again, MoviePass users discovered that they couldn’t order tickets to Mission: Impossible—Fallout at all, a development that seemed like a very bad omen for MoviePass’ future. Today, it seems less like the end is in sight and more like Death itself is gently tapping on MoviePass’ window with its bony fingers, beckoning for the company to join it in the black void of eternity. According to Deadline, the stock of MoviePass’ parent company Helios & Matheson dropped to 80 cents a share today, which is an important number because any stock that trades for under $1 for 30 days could be de-listed by the Nasdaq. Without getting into how the stock market works, that would absolutely be the end for MoviePass. But wait, because it gets even worse! As reported by Business Insider, MoviePass CEO apparently told employees at an all-hands meeting today that MoviePass’ app will not support Christopher Robin or The Meg, the next two big movie releases, and he “implied the practice of not offering tickets to major movies would continue for the foreseeable future.” The way MoviePass works is that the company pays theaters full price for tickets, and then it charges the consumers a flat subscription fee that doesn’t come close to covering the amount of movies that one is permitted to see with a MoviePass. By blocking big movie releases, MoviePass saves money on the tickets people actually want, so instead of having to a million tickets for The Meg, it might only have to buy a handful of tickets for, say, The Equalizer 2. MoviePass probably wouldn’t be burning through so much cash right now if this had been the model from the beginning, but then it never could’ve gotten the three million subscribers it has now if people had gone in knowing that they wouldn’t be able to see big movies.